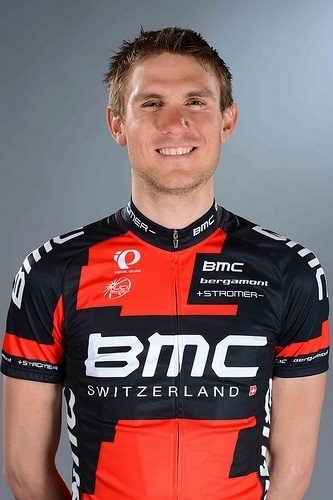 Tejay van Garderen (BMC Racing) claimed the final yellow jersey in the 2013 Amgen Tour of California after Peter Sagan (Cannondale) out-kicked the bunch in Santa Rosa to take his second stage win and clinch the green points jersey. Thomas De Gendt (Vaconsoleil-DCM), Jason McCartney (Bissell) and Antoine Duchesne (Bontrager) formed the early break of the day, after a neutral stretch over the Golden Gate Bridge, and 52km into the 130.4km race they had nearly four and a half minutes on the bunch. With 40km to race their advantage was under two minutes, though, as Garmin-Sharp pushed the pace for sprinter Tyler Farrar. As the gap slipped under a minute with 22km to go, Duchesne decided to go it alone. De Gendt sat up to wait for the inevitable. McCartney gutted it out, riding back up to Duchesne, as Omega Pharma-Quick Step and Cannondale began taking an interest in the chase. The two had 45 seconds in hand with 16km to race. But with 10km to go it was all over — Duchesne was the last man standing, and he too was swept up just before the bunch roared into downtown Santa Rosa for two laps of a finishing circuit. Cannondale took the front for the first go-round, hoping to launch Sagan to the stage victory, and then Garmin assumed command for the second. Going under the red kite Cannondale shouldered forward once again, as did Orica-GreenEdge. The bunch drove into the tunnel and toward the finish — and Sagan hit the sunlight very much a man on the move. He went early on the right, holding his advantage all the way across the line. Daniel Schorn (Team NetApp) took second with Farrar third. “I’m very happy to have won today,” Sagan said. He credited his teammates for delivering him to the front; once through the final turn, he launched his sprint in the final 200 meters. When the overall numbers were crunched, it was van Garderen clinching the victory by 1:47 over Michael Rogers (Saxo-Tinkoff). Javier Acevedo (Jamis-Hagens Berman) finished third overall at 3:26. Van Garderen said the overall victory came as something of a relief to him, and credited fatherhood for a more relaxed approach to competition. “It’s a big relief. It’s a weight off my shoulders, a monkey off my back,” said van Garderen, who cradled his tiny daughter on the podium. “Hopefully this gets the ball rolling and we get a few more. • Jerseys: Yellow, van Garderen; sprint, Sagan; mountains, Carter Jones (Bissell); best young rider, Lawson Craddock (Bontrager); most courageous, McCartney.